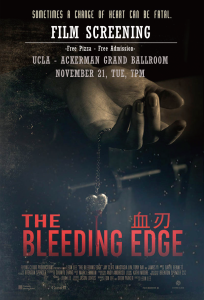 Los Angeles/CA Film aficionados are invited to a special screening of THE BLEEDING EDGE, a revealing tale of state condoned persecution and infringement on all people’s rights within the People’s Republic of China. 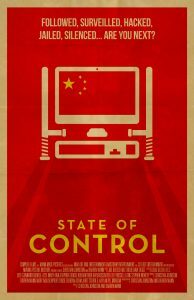 Also a preview of STATE OF CONTROL a riveting indictment of repressive forces in Tibet with Director’s Leon Lee and Christian Johnston will join the conversation with human rights advocate Anastasia Lin. DAFOH spokesperson Dr. Dana Churchill from the Churchill (Wellness) Centers, internationally acclaimed photographer Shelby Knick and Nhat Hoang of Honest Abe List are also slated to attend. Both films are set to unspool on Tuesday, November 21, 2017 – 7:00 PM – 9:30 PM PST at the UCLA Ackerman Grand Theater, 308 Westwood Plaza, Los Angeles, California 90024. 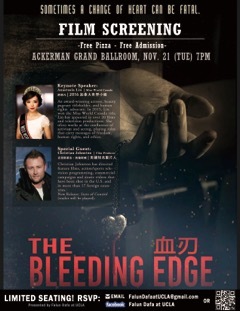 Director Leon Lin, and lead role in THE BLEEDING EDGE Anastasia Lin, an outspoken advocate of freedom of speech. Violence can be swift and merciless when a population is dehumanized and governments are permitted to perpetuate unspeakable crimes against humanity. It is incumbent that outside voices, like those of conscientious film director’s Leon Lee and Christian Johnston sound the clarion call demanding that government repression not be tolerated. Film is a powerful tool to raise conscious while shining a powerful spotlight on the plight of the persecuted. A searing follow-up to his short film RAVAGE, the Peabody Award-winning director Leon Lee of Vancouver based Flying Cloud Productions, states,“ THE BLEEDING EDGE, sheds light on systemic repression of human rights enabling the persecution of prisoners of conscience for profit.” According to Nhat Hoang of HonestAbeList, (a principled community bulletin board that is soon to launch comments on the THE BLEEDING EDGE , “Herein audiences see direct testimony to a message that is universal and especially pertinent today with all the strife in the world”.The screening is organized by Falun Dafa at UCLA; a meditation and Qigong group. The organization provides free workshops on Falun Dafa, a traditional high-level Qigong practice originating centuries ago in China. With over a hundred million practitioners in seventy countries; Falun Gong curates the heart to follow universal principles of ‘Truthfulness, Compassion and Tolerance’ (Zhen Shan Ren). This will be an opportune moment for ‘photo ops’ , insightful questions and answers and to hear firsthand the facts about countries that extract indefensible costs (both psychological and physical) on the rights and well-being of its’ citizens. Photos: Director Leon Lin, and lead role in THE BLEEDING EDGE Anastasia Lin, an outspoken advocate of freedom of speech.